Eight years in the making, next month The Multiversity arrives! Beginning as far back as the conclusion of his "Seven Soldiers of Victory" megaseries, Scottish comics scribe Grant Morrison began to make cryptic statements about a larger, Cosmological, multiple-Universe spanning meta-Comic, a project that by 2009 had become known as "Grant Morrison’s ‘Multiversity’". The book promising to bridge the diverse fictional worlds that have existed in DC Comics' history of rewriting their continuity multitudinous times via whatever current marketing campaign, crossover event or 'Crisis' of universal perspective that the publisher had established in it's 70+ years of serialized storytelling. Morrison then became engrossed in writing what may prove to be the major superhero opus of his career, in the form of a award-winning 7 year Batman story which even managed to weave into it's fold his own take on a crossover Cosmological "Final Crisis". In addition to just about every major DC character, this multi-dimensional event book encompassed in it's sprawling conceptual expanse the groundbreaking work of Jack Kirby's Fourth World creations of the 1970's. In the midst of this extended period of activity, Multiversity seemed to sink further and further into the realm of the hypothetical. 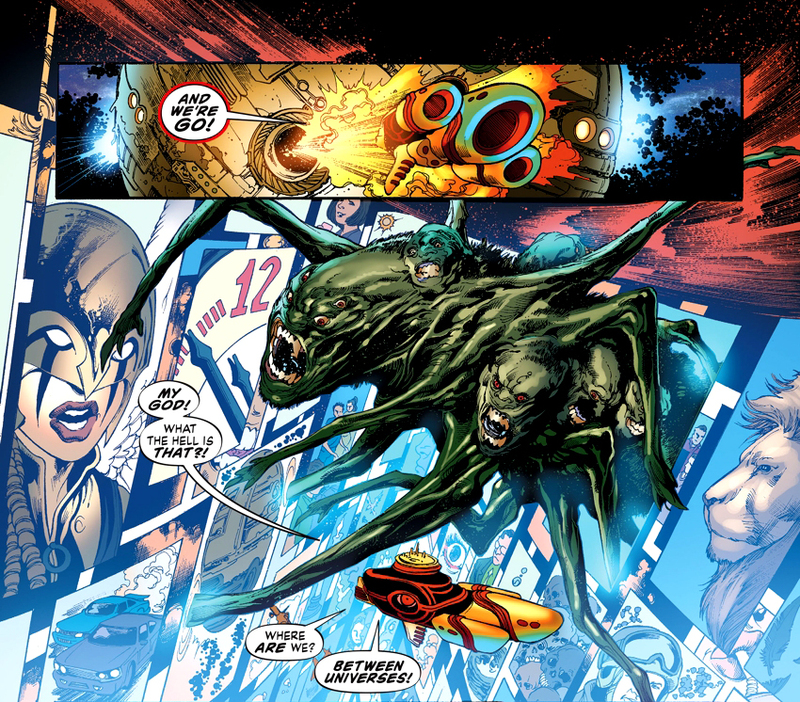 A very brief synopsis of the threat implied by glimpsing the "Haunted Universes" contained within it's pages was seen in Rolling Stone's "Grant Morrison: Psychedelic Superhero". Come 2012 and the one-off Morrison-Con celebrating all things Grant along with a select body of artists, and writers including, Jonathan Hickman, Robert Kirkman, J.H. Williams III and others working in the genre-warping outer edge of the comics medium. The big news of the festival came during an interview held in the Future of the Third Millennium panel, in which it was established that not only was the book well and very much alive, but a set of new "Hi-Resolution Frank Quitely Artwork from Multiversity" was revealed. 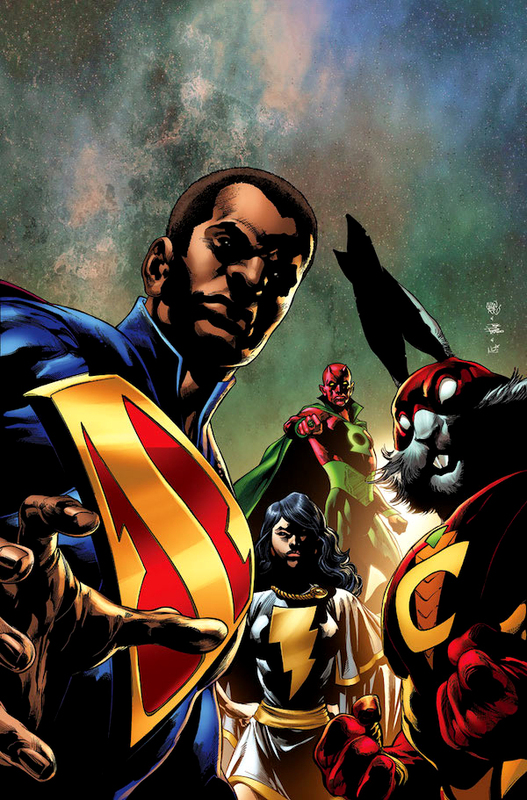 Another protracted silence followed until April of this year, when it was announced that after nearly a decade of delays, a date had been set and "Morrison is to Unleash 'The Multiversity' in August". A month later DC Comics presented their solicitations for the Summer's books including the first two issues of The Multiversity. These arrived along with a grand, preposterous synopsis by it's author, delivering on the years of hints and speculation: "Prepare to meet the Vampire League of Earth-43, the Justice Riders of Earth-18, Superdemon, Doc Fate, the super-sons of Superman and Batman, the rampaging Retaliators of Earth-8, the Atomic Knights of Justice, Dino-Cop, Sister Miracle, Lady Quark, the legion of Sivanas, the Nazi New Reichsmen of Earth-10 and the latest, greatest Super Hero of Earth-Prime: You! But even with a multitude of alternate worlds to choose from, where every variation is possible, can anyone hope to prevail against the onslaught of ultimate evil and undying hatred in the unstoppable form of a one-time cosmic defender with unimaginable powers?! Join us, if you dare, for the beginning of The Multiversity!" If all of that isn't sufficient to pique your love of the comics medium (and the audacity of the expanse of imagination, word and image that only this serialized medium can capture), an even more in-depth plumbing of Multiversity's Quantum breadth came last year during a media event in LA, covered in MTV's "All Becoming Starchildren: An Evening With Grant Morrison". Closing this out, a detailed map of the Multiverse and the final word before the series' launch from this year's San Diego Comic-Con! Wired's interview with Morrison makes it clear we're looking at the DC Universe through the lens of Superstring Theory and the Music of the Spheres as devices in his expansion on decades of previously posited alternate-universe storytelling. Appropriately titled, "Multiversity Turns the DC Universe Into a Quantum-Theory Freakfest", it establishes a multitude of universes populated by personages and concepts Comics Alliance calls, "Vampire Batman, Hypnotic Induction, And God: Grant Morrison Talks ‘The Multiversity’".